As many of you could guess, Ice Cream Surfer is on a break. But I won’t stop making comics. If you like the sense of humour and craziness from ICS you’d love my other comics. 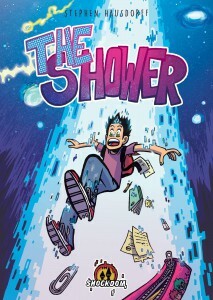 The Shower is getting published in Italy by Shockdom on march the 30th. It’s a comic about a teleporting shower. Follow me on my FB artist page to know more about the coming comics not just Ice Cream Surfer.